We wrote about the iRig previously, but this update just takes the mobile DJ set up to a whole new level. 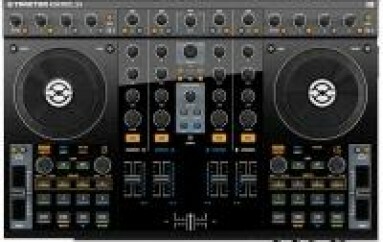 In fact, old school purists just might throw up in their mouths when they get a load of the new DJ Rig for iPad. Full of more features than available to me as a teen with $1000’s of dollars in equipment, this lil monster makes DJing so mobile, I can already see DJ panhandlers on the subway (which is what I plan on doing with it). 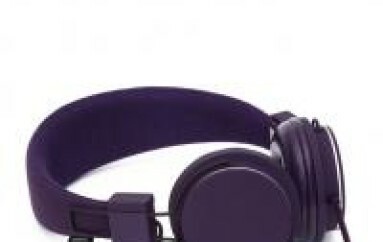 Will this make it even easier for just about anyone to call themselves a DJ? Perhaps, but not much more than those who put down a few hundred bucks more on any of the countless controller options out there. Fact is, this is much more than a novelty toy, this lil contraption is great to get your groove on, develop some concepts, practice, and more. Real DJs will push its offerings to the limit. Wannabes might impress themselves and maybe even a friend or two, but don’t worry, they won’t be DJing at Ibiza as a result anytime soon. I hope. Let’s pray anyway, won’t we? 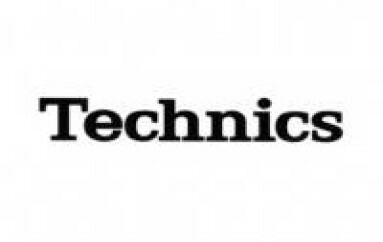 September 27th, 2012 – IK Multimedia, the world leader in mobile music-creation apps and accessories, announced today that DJ Rig for iPad® is now available on the App Store. DJ Rig for iPad takes mobile DJ mixing to a completely new level, providing a comprehensive suite of professional DJ mixing tools, all in one convenient iPad app. 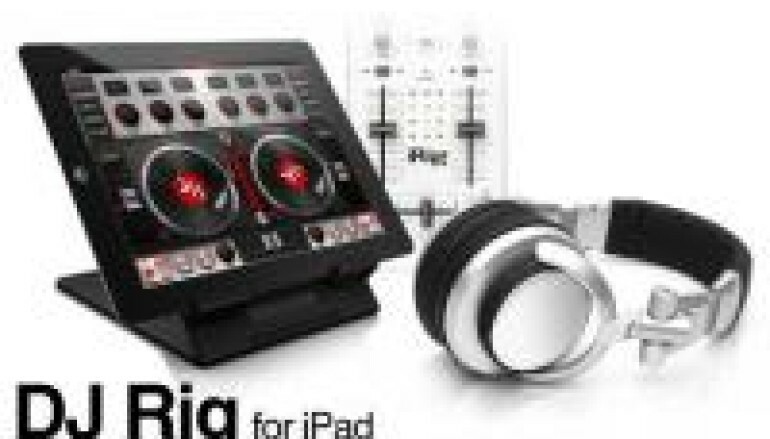 DJ Rig for iPad greatly expands the feature set from DJ Rig for iPhone, offering numerous new capabilities that previously have only been available on professional DJ software for the Mac and PC. With DJ Rig for iPad, mobile DJs will possess the virtual equivalent of a full professional DJ setup – two turntables or CD players, a DJ mixer, a DJ multi-effects unit, a phrase sampler and more, all in an portable package to take their spin to the next level, anytime and anywhere. DJ Rig for iPad is a fully self-contained DJ environment that can be directly connected to a sound system, but even more functionality is available when it’s used in tandem with IK’s new iRig MIX ultra-compact mobile DJ mixer. iRig Mix offers complete physical track control, thanks to its full-length channel faders and crossfaders, additional EQs, and direct connections for headphones, microphones, loudspeakers or a PA system. When used together, DJ Rig and iRig MIX provide a comprehensive DJ setup that packs all the features the most demanding DJs need – all in an ultra-light combo rig that can be up and running in seconds. Familiar double Deck configuration with a triple twist – When first launched, DJ Rig for iPad looks and feels very familiar – its interface accurately replicates a full dual-deck hardware rig with each deck routed through the audio output jack on the iPad (split stereo). What’s different is that each deck has three visual modes: “Vinyl” for traditional creative scratch effects, “Digital” jog for a more traditional CD manipulation and the new “Waveform” view for accurate cue placement, synchronization and visualization of beats. Sync, mix & scratch – DJ Rig for iPad with CloneDeck™ technology allows DJs to mix and scratch on their iPads, just like they would with hardware counterparts. The built-in dual-deck system with a crossfader allows them to mix with ultra-accurate precision, and the Tempo Sync, X-Sync and Beat Match functions automatically align the beats from any two sources for flawless transitions. The new AutoMix feature will automatically crossfade and mix music to keep the beat going even when the DJ steps away. New creative DJ effects provide unlimited sonic possibilities – DJ Rig for iPad features 18 available BPM-synced DJ effects for customizing mixes and build-ups, always at the perfect tempo. Effects include Delay, Flanger, Crush, HP filter, LP filter, BP filter, Compressor, Wah, Phaser, Fuzz, Reverb, and Stutter, plus 6 completely new effects: Noise, Tail, Brake, Spin, Twist UP and Twist DOWN. The X/Y effects interface provides full creative control and real-time manipulation that will inspire DJs to be their creative best. On-board sampler with expandable sound banks – DJ Rig for iPad features an “on-the-fly” sampler with 9 accessible and assignable pads for adding sound bites and samples to mixes. For even more creative flexibility, DJ Rig for iPad provides “live sampling” and “looping” functions for completely customizing and personalizing the mix. DJ Rig for iPad is now available in the App Store worldwide at an introductory price of only $19.99/€15.99. A FREE version is also available for download.